Tap Logo area to zoom. Tap 3 area to cycle hand accent colors, 6 in all. Tap 9 area to cycle dial colors, 6 in all. 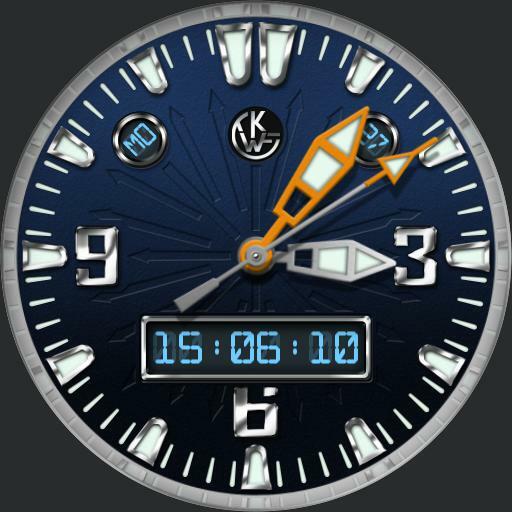 Tap date display to open UColor selector to change active LCD text colors. Tap Day area to park hands. Tap LCD display to cycle modes. In Chrono mode tap 7 to 8 area to start/stop and 4 to 5 area to reset. Tap Center logo for dim mode menu. Tap Color text to cycle dim mode color Blue or green. Tap Mode text to cycle dim modes Normal, Always On, Auto Always On and Off. Tap X to close. Seconds hand is watch battery indicator on dim.